As the new year approaches I can’t help but reflect upon common themes of what has consisted my experiences of being a member of the swing dance community in years past. 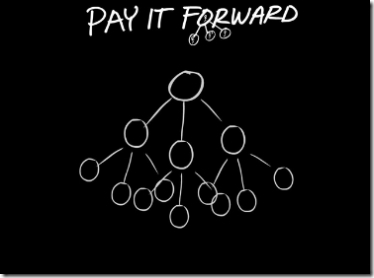 One I want to touch on in particular is the concept of paying it forward. The concept of asking that a good turn be repaid by having it done to others instead. When I first started dancing Southern California I went to a venue called Rock Harbor, which was a free venue that the instructors were local dancers who generously donated their time. One day I noticed two of the instructors there dancing Collegiate Shag, a dance I had seen previously and was intrigued by. Alas, my struggle though was like many people who want to learn Balboa, I had difficulty finding lessons. Those two instructors Alan and Amantha were nice enough to change the lesson the next week to teach Shag so I could learn the basic step and set me on the path to delving into the dance. Last night when I was out dancing and I noticed a girl off on the side trying to figure out a Shag double rhythm basic and struggling with it. I offered to help and a few minutes later she was doing okay enough to follow a basic in open and closed position and seemed thrilled. It was only maybe five to ten minutes tops of my time at most. For myself my best way of repaying the gift that Amantha and Alan gave me is to render the same gift they gave to me onto others. I encourage those of you who have experience in the dance community to do the same. It is a simple act that fosters growth in our community and invaluable to the individuals that it assists. This entry was posted on December 30, 2011 by Apache. It was filed under Dance, Personal .